The famous Fibonacci sequence has captivated mathematicians, artists, designers, and scientists for centuries. Also known as the Golden Ratio, its ubiquity and astounding functionality in nature suggests its importance as a fundamental characteristic of the Universe. We’ve talked about the Fibonacci series and the Golden ratio before, but it’s worth a quick review. The Fibonacci sequence starts like this: 0, 1, 1, 2, 3, 5, 8, 13, 21, 34, 55 and so on forever. Each number is the sum of the two numbers that precede it. It’s a simple pattern, but it appears to be a kind of built-in numbering system to the cosmos. Here are 15 astounding examples of phi in nature. Leonardo Fibonacci came up with the sequence when calculating the ideal expansion pairs of rabbits over the course of one year. 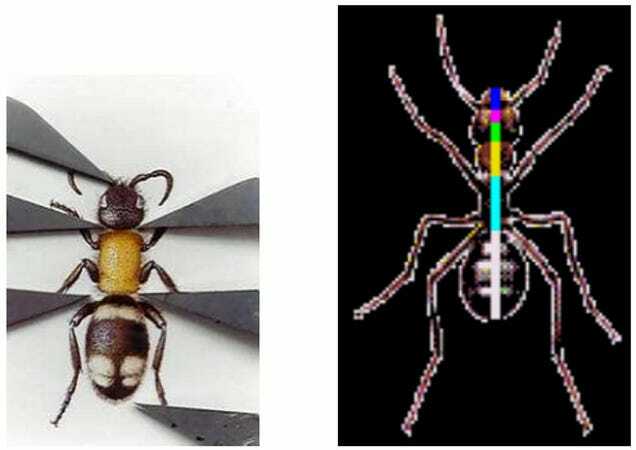 Today, its emergent patterns and ratios (phi = 1.61803…) can be seen from the microscale to the macroscale, and right through to biological systems and inanimate objects. While the Golden Ratio doesn’t account for every structure or pattern in the universe, it’s certainly a major player. Here are some examples. The head of a flower is also subject to Fibonaccian processes. Typically, seeds are produced at the center, and then migrate towards the outside to fill all the space. Sunflowers provide a great example of these spiraling patterns. In some cases, the seed heads are so tightly packed that total number can get quite high — as many as 144 or more. And when counting these spirals, the total tends to match a Fibonacci number. Interestingly, a highly irrational number is required to optimize filling (namely one that will not be well represented by a fraction). Phi fits the bill rather nicely. 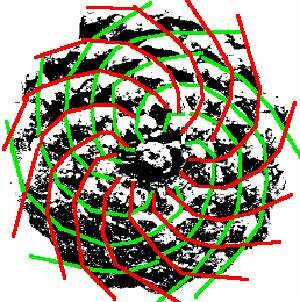 Similarly, the seed pods on a pinecone are arranged in a spiral pattern. Each cone consists of a pair of spirals, each one spiraling upwards in opposing directions. The number of steps will almost always match a pair of consecutive Fibonacci numbers. For example, a 3-5 cone is a cone which meets at the back after three steps along the left spiral, and five steps along the right. Likewise, similar spiraling patterns can be found on pineapples and cauliflower. The unique properties of the Golden Rectangle provides another example. This shape, a rectangle in which the ratio of the sides a/b is equal to the golden mean (phi), can result in a nesting process that can be repeated into infinity — and which takes on the form of a spiral. It’s call the logarithmic spiral, and it abounds in nature. 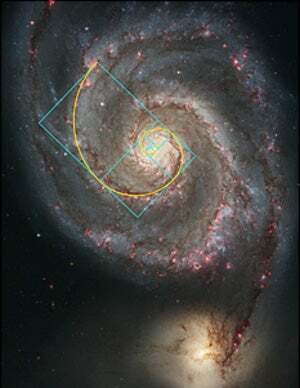 Not surprisingly, spiral galaxies also follow the familiar Fibonacci pattern. The Milky Way has several spiral arms, each of them a logarithmic spiral of about 12 degrees. As an interesting aside, spiral galaxies appear to defy Newtonian physics. As early as 1925, astronomers realized that, since the angular speed of rotation of the galactic disk varies with distance from the center, the radial arms should become curved as galaxies rotate. Subsequently, after a few rotations, spiral arms should start to wind around a galaxy. But they don’t — hence the so-called winding problem. The stars on the outside, it would seem, move at a velocity higher than expected — a unique trait of the cosmos that helps preserve its shape. Even our bodies exhibit proportions that are consistent with Fibonacci numbers. 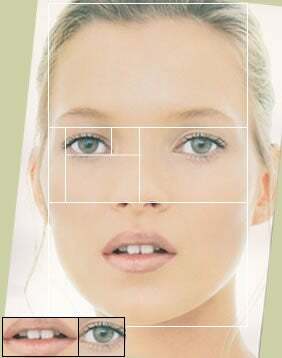 For example, the measurement from the navel to the floor and the top of the head to the navel is the golden ratio. Animal bodies exhibit similar tendencies, including dolphins (the eye, fins and tail all fall at Golden Sections), starfish, sand dollars, sea urchins, ants, and honey bees. Speaking of honey bees, they follow Fibonacci in other interesting ways. The most profound example is by dividing the number of females in a colony by the number of males (females always outnumber males). The answer is typically something very close to 1.618. 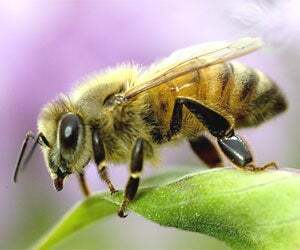 In addition, the family tree of honey bees also follows the familiar pattern. Males have one parent (a female), whereas females have two (a female and male). Thus, when it comes to the family tree, males have 2, 3, 5, and 8 grandparents, great-grandparents, gr-gr-grandparents, and gr-gr-gr-grandparents respectively. Following the same pattern, females have 2, 3, 5, 8, 13, and so on. And as noted, bee physiology also follows along the Golden Curve rather nicely. When a hawk approaches its prey, its sharpest view is at an angle to their direction of flight — an angle that’s the same as the spiral’s pitch. 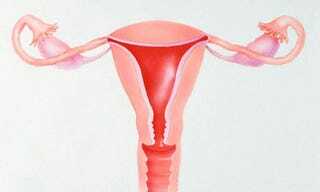 According to Jasper Veguts, a gynaecologist at the University Hospital Leuven in Belgium, doctors can tell whether a uterus looks normal and healthy based on its relative dimensions — dimensions that approximate the golden ratio. Over the last few months he has measured the uteruses of 5,000 women using ultrasound and drawn up a table of the average ratio of a uterus’s length to its width for different age bands. The data shows that this ratio is about 2 at birth and then it steadily decreases through a woman’s life to 1.46 when she is in old age. “This is the first time anyone has looked at this, so I am pleased it turned out so nicely,” he said. Thanks to Calvin Dvorsky for helping with the article!